Chhatris consits of a set of No. pillars (4,6,8,12,16.....n) and usally have one dome/shikhar. 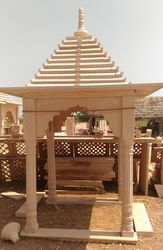 Chhatris are used for various purposes as per the need. 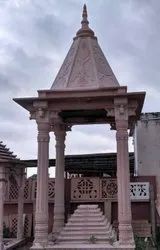 Memorial type of chhatris usually consist of a platform girded by a set of ornate pillars (mostly more than 4 no of pillars) which hold up a stone canopy. 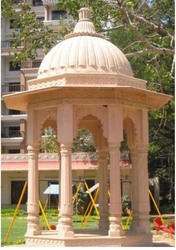 Chhatris are also used to decorate buildings corner or entrance. These chhatris are purely for decorating building and have no utility, but are a classic folly displaying the status and wealth of the owner. Chhatris are widely used in palaces, in forts, or to demarcate funerary sites, Hotels, Resorts, marriage homes, public parks etc. 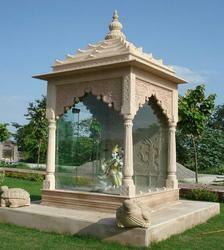 Chhatri are widely used as monument or as decorative since ancient times, some times they are also used as Mandir.. There are various designs and size available as per client needs. Design can vary not only from with carving and engraving pattern but also by shape. Some chatri come with 4 pillars in square shape and some chatri come with more than 4 pillars and such chhatri come in round shape. This chhatri compromise of 8 No. 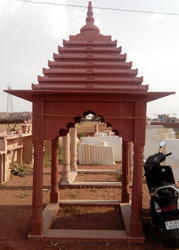 of pillars and size is 8ft * 8ft base diameter.